This card is made in a similar style to Linda, The Funkie Junkie. I hope she doesn't mind me calling her my mentor. When I discovered her blog and started following her she just wowed me with all her wonderful projects and I admire how she always is very true to her style of creating. She encouraged me to get out my sewing machine, gave us all a wonderful tutorial on these seam binding bows, and said stretch those creative wings. My pattern paper is from a new set of papers from Stampin Up, very yummy. 2 Layers-I sewed the pattern paper to Rich Razzleberry card stock. 3 Different Stamped Images-I stamped the bird, eggs, and grass. 4 Embellishments-Seam Binding Bow, antique brad, crystal eye on the bird, and here's where it gets tricky and I'll probably get kicked out of this challenge--I did stamp the Happy Birthday sentiment, but I wanted to count that as an embellishment. You don't have to pick me to win or be featured, I just love how this card turned out, so I just really wanted it to be seen. Supplies: Ivory Card Blank 5 1/2" X 6" Halcraft, Papers: Stampin Up-Rich Razzleberry, Designer Series Paper Botanical Gazette, Very Vanilla, Stamps: Posh Impressions-grass, Stampin Up-Engraved Greetings, Nature Walk, Ink: Stampin Up-Early Expresso, Old Olive, Stampin Up-Very Vanilla Seam Binding, Antique Brad, Recollections Rhinestone Sticker, Nellie Snellen die-MFD013, Mother Rubber-Moon Shadow Mist-Smoky Sapphire, Memories Mists-Blueberry Shake, sewing machine, Stampin Up dimensionals. I love being your mentor, Beverly, but must ask. When does the pupil surpass the teacher? I think we are getting close to that point, if not there already! Your recent work has been incredible and I'm so excited to see you such a hit over at Ginger Gems - I haven't even made it over there myself! Love this card, but you knew I would - LOL! That DP and the stamps are phenomenal. Great sewing and seam binding bow too. You definitely nailed the OCC challenge this week! This is unbelieveably gorgeous! I love the stamps you used, the bird with the eggs, fantastic. Thanks for playing along with us at the OCC! Very pretty--I really like this one!! 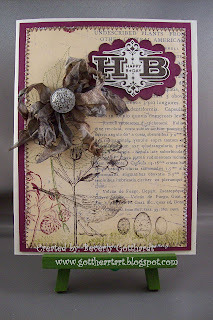 OK I think we placed the exact stampin up order, you have used 2 sets I just bought during my SAB order hee hee(but I haven't used mine yet) that is breathtaking! Beverly, your card is simply gorgeous! thank you for playing along with us @ OCC, and I hope we get to see more of your work! WOW, this is GORGEOUS! Love your style, the layout, the images and the colors work so good together. Thanks for playing along with 'Our Creative Corner' this week!